Precision Wildlife Services: The Unidentified Creature! As I approached this creature I stated to the customer "This isn't a bat a tall!" Did you know that if you have an animal, looking at you while at work or in your kitchen, there's a company you can call that responds immediately anywhere in New England? Sounds exciting already doesn't it? Well this is an everyday occurrence for us at Precision Wildlife and that's what makes our job so Great! Live animal removal calls, bats, raccoons, birds, snakes and yeah I guess skunks too! 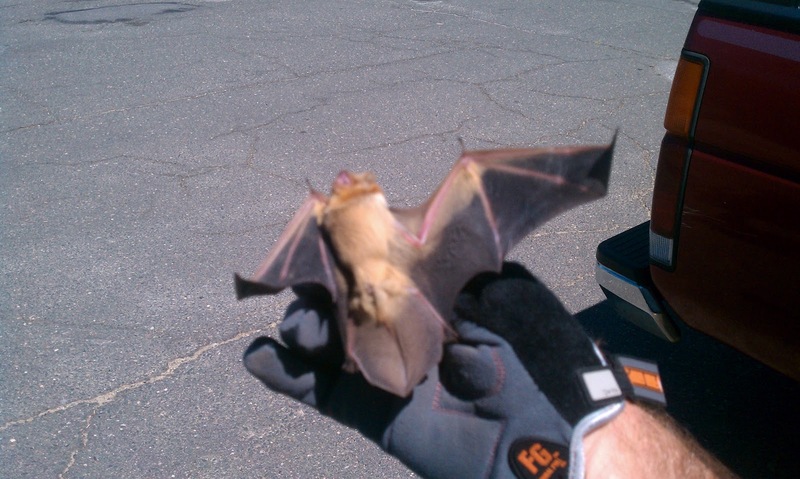 Back in August we received a call from a customer in the North Shore of MA, for a possible bat inside of their building...ALIVE! They stated to us that is was in their co. warehouse and that no one could use the restroom out there because of the bats location. In August the busiest time of the year and we have no technicians in the area to send, what to do? 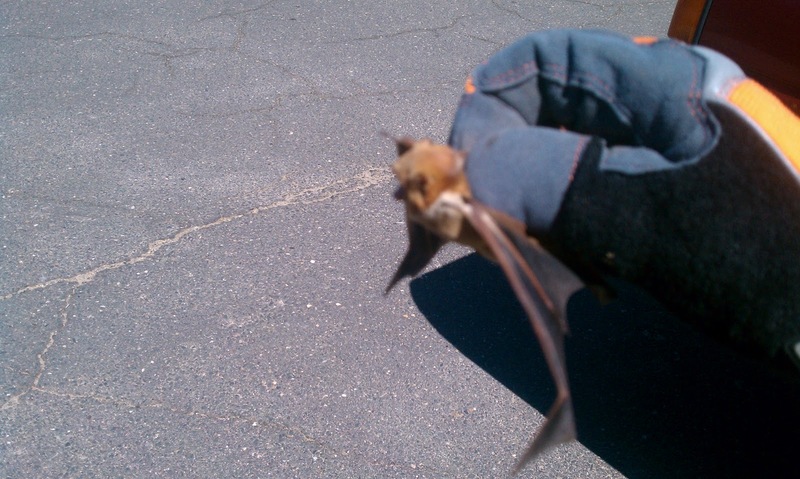 Well I just go and I'm pretty excited about it too, because its a business...its a bat....they could have more...and I enjoy walking in plucking him out and then knowing how to fix a potentially more serious issue, as all of our experienced wildlife techs do! 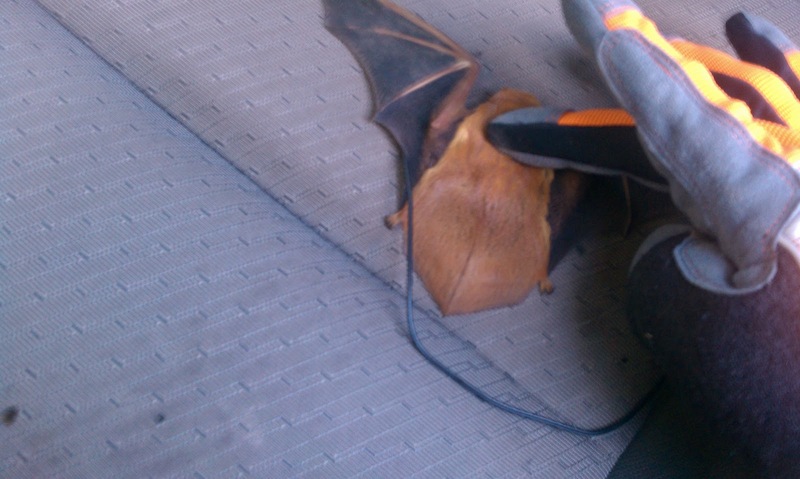 As soon as I saw this thing I said "THAT'S NOT A BAT" and I wish I took a picture of that moment but I was focused on getting "it" before "it" flew. It looked like a giant bug with antennas and eyes and had a reddish gold color to it. Now we all know that the bats we deal with are; they are brownish color with black wings you know big browns and littles, don't we? 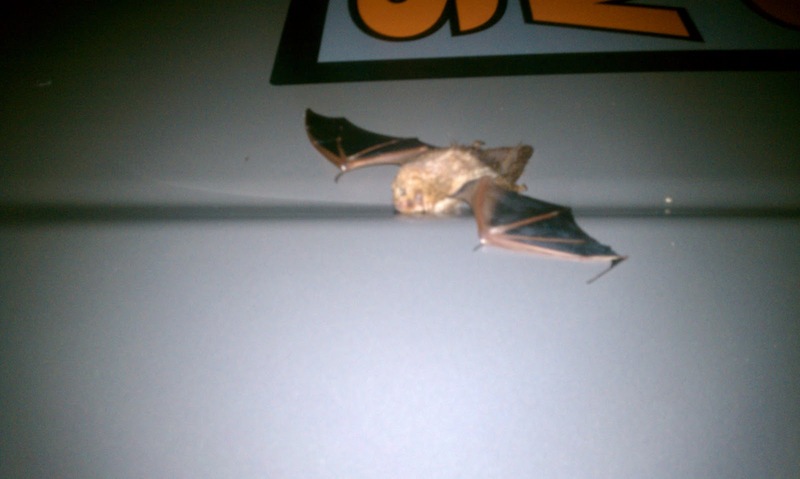 After I secured it in my hand I quickly realized it was definitely a bat and it was one I had never seen before. I walked it out to the truck pretty quickly and put The Bat into a secured container and then went to handle the fun stuff.. The actual removal took above 2 minutes and the other 58 minutes was used up for inspection of the building, paperwork, discussing the type of bat and explanation that there building could not be bat proofed as the costs would soar far to high with all the big bay type doors and unfinished window sections on the warehouse. This all being said I did a thorough inspection and then took some photos of the bat which I believe to be called a "Red Bat" although this could be proven otherwise! In fact if it is there's a hat in it for that person. After the excitement of removing a non-brown live bat from a building had settled and when I was done photographing our bat friend we did let it fly away. Bats are protected and Precision Wildlife is a humane co. but we always determine if contact was made by anyone before releasing the bats into the wild. If you have a bat looking and its in you living room, basement or even at your place of employment... ask a our bat specialists if it is OK for you to let it fly away or ask us to get it out for you, if you think you can't!